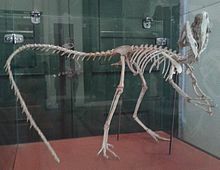 Santanaraptor (meaning "Santana Formation thief") is a genus of tyrannosauroid dinosaur that lived in South America during the Early Cretaceous (late Aptian-early Albian), about 112 million years ago. The holotype (MN 4802-V) is a juvenile partial skeleton consisting of three caudal vertebrae with chevrons, ischia, femora, tibia, fibula, pes, and soft tissue. The fossilized tissue includes a thin epidermis, muscle fibers, and possibly blood vessels. It was unearthed in 1996 from the Romualdo Formation (Santana Group) in the Ceará State, northeastern Brazil. While primarily known from hindquarter elements, the individual represented by the fossil may have reached 1.25 metres (4.1 ft) in length. The fossil consists of bones from the pelvis, hindlimbs, and tail. These provide little information on its overall appearance. However, it was definitely a coelurosaur, and a few of its details suggest that it might be a member of the tyrannosauroids. It is presumed to be similar to Dilong and Guanlong in that it had long arms, three fingered hands, and slim hindlimbs. The type species is S. placidus, first described by Kellner in 1999. The species epithet refers to Placido Cidade Nuvens [pt], who founded the Museu de Paleontologia da Universidade Regional do Cariri [pt]. Santanaraptor was originally thought to be a maniraptoran theropod when it was first discovered. However, it is now thought to be a basal coelurosaur based on several features present on the femur. Santanaraptor was tabulated by Holtz (2004) as the first tyrannosauroid known from Gondwana, a position also found by Delcourt and Grillo (2018). ^ a b Benton, Michael J. (2012). Prehistoric Life. Edinburgh, Scotland: Dorling Kindersley. p. 321. ISBN 978-0-7566-9910-9. ^ Kellner, A. W. A. (1999). "Short Note on a new dinosaur (Theropoda, Coelurosauria) from the Santana Formation (Romualdo Member, Albian), northeastern Brazil". Boletim do Museu Nacional (Serie Geologia). 49: 1–8. ^ Holtz, Thomas R. Jr. (2004). "Tyrannosauroidea". The Dinosauria (Second ed.). University of California Press. ^ Rafael Delcourt; Orlando Nelson Grillo (2018). "Tyrannosauroids from the Southern Hemisphere: Implications for biogeography, evolution, and taxonomy". Palaeogeography, Palaeoclimatology, Palaeoecology. in press. doi:10.1016/j.palaeo.2018.09.003.